New York Times best-selling author Donald Miller uses the seven universal elements of powerful stories to teach listeners how to dramatically improve how they connect with customers and grow their businesses. Donald Miller's StoryBrand process is a proven solution to the struggle business leaders face when talking about their businesses. This revolutionary method for connecting with customers provides listeners with the ultimate competitive advantage, revealing the secret for helping their customers understand the compelling benefits of using their products, ideas, or services. 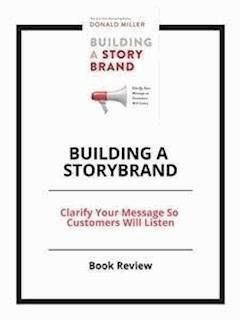 Building a StoryBrand does this by teaching listeners the seven universal story points all humans respond to, the real reason customers make purchases, how to simplify a brand message so people understand it, and how to create the most effective messaging for websites, brochures, and social media. Whether you are the marketing director of a multibillion-dollar company, the owner of a small business, a politician running for office, or the lead singer of a rock band, Building a StoryBrand will forever transform the way you talk about who you are, what you do, and the unique value you bring to your customers. Traditional marketing which talks about how good your company is and how impressive your products are is an incredible waste of resources. It's just background noise and it confuses customers. To be noticed, you've got to clarify your message and explain how you help customers survive and thrive. 1Marketers keep talking about product features – rather than focusing on the aspects of their offerings that will help people survive and thrive. The human brain's primary job is to help us survive. To get people to notice your products or services, you need to use stories which describe how your product helps people survive, be accepted, find love or realize their dreams. 2Marketers force people to burn too many calories in an effort to understand their offer – which again goes completely against human nature. Potential customers will tune you out if you throw too much information at them at once. With that in mind, the key to being heard in today's marketplace is to make your message about something that helps the customer survive and to do that in a way they can understand without burning too many calories. The most powerful tool for achieving that is to use stories involving your customers. The point is stories work because they can make music out of noise. Stories are intensely engaging and can hold a person's attention for hours. Stories are incredibly addictive and if you can figure out your customer's story and then place yourself smack in the middle of it, impressive things can happen. The marketing power of stories is perfectly illustrated by Steve Jobs and Apple. In 1983, Apple launched a computer called Lisa with a nine-page ad in the New York Times spelling out Lisa's technical features. The computer bombed and Steve Jobs left the company. When he returned after a stint running Pixar, Jobs launched Think Different which highlighted interesting stories. Apple stopped featuring products in their ads and instead made customers their heroes. The company's business soared on the strength of simple and relevant customer stories.